You are here: Home / Walk It Out / A Book For Those Who Read God’s Word and Long to Obey! 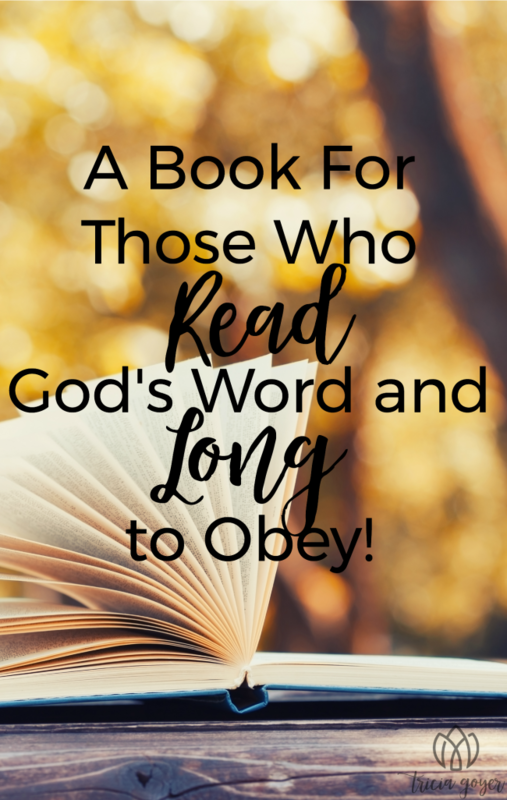 A Book For Those Who Read God’s Word and Long to Obey! Friend, I am so excited to connect with you. One of my greatest joys in life is connecting with God-loving people who are excited about following God and discovering His great purposes in life … and it looks as if I found a like-minded companion in you! But I have a secret for you. All over this world there are people who are still longing to discover their purpose. They want to feel as if God has a good plan for them, but they don’t know how to find it. They don’t understand that the Bible has the answers. All over the world there are people wondering … and wandering. They question why they are here on earth. They have no clue what difference they can make. They want to be a person who can make a difference in the lives of others, but how can they do that when they have no idea how to even help themselves. Deep down they may have an inkling that the Bible has the answers, but how can an ancient book help with today’s problems? I understand. I was there. At 17 years old I found myself pregnant, with my boyfriend out of the picture. It was my Senior year, supposedly one of the best years of my life. I was an honor roll student and cheerleader, and overnight my world came crashing down. I dropped out of high school and spent most of my days sleeping … and crying. I was sure I’d messed up my life for good. Things did not change overnight, but a glimmer of hope was deep inside me that hadn’t been there before. I did not return to high school. I did not get my boyfriend back. I did not write out a 10 year plan for my future. Instead I did one simple thing. I started reading my Bible. And after a few years (yes, years) I started thinking, What if I actually was open to doing what the Bible said? The steps of obedience started small. They began with opening my heart to forgiving myself for my past mistakes. Then God opened my eyes to the needs of others around me, such as other teen moms who were facing the same struggles I once faced. Soon I started writing, wanting to give hope to others. I helped to start a pregnancy care center and years later my husband and I began adopting children. Maybe your story is similar. Oh how I would love to sit over coffee with you and swap God stories. Just thinking about it gives me goosebumps! And knowing how God works, I can bet that the BIG things that God has done in your life have all started by taking small steps of obedience. Am I right? It’s amazing how simple steps of obedience have led to all the mind-blowing things that God has done in my life, too. I’m now the author of over seventy books from publishers like Random House and Harper Collins, and the mom of ten children. Yet, just as important, I still reach out to teen moms in the inner city, and I am still open to loving the one person-in-need God places before me that day. God’s Word, that ancient book, does apply to everyday life—as you well know. Our lives—and all the radical results that came from my obedience—prove that. Yet isn’t it hard to see other people we know struggling to find their unique purpose? Can you think of one person right now who needs this message of hope and truth? Do you? I’d love to share more of my story, and how I discovered how to obey God and follow Him step-by-step with those who may be struggling in my new book, Walk It Out: The Radical Results of Living God’s Word One Step at a Time. This book releases soon, and I know it can be a hope and encouragement to you on this journey. My desire is that you will see even more clearly how God can take a very ordinary person, one who seeks ease and comfort, and He can transform her (or him!) into someone who is impacting others in real and tangible ways. As God-followers when we see how God is using others it helps us to consider God’s plans in new ways we may not have considered before. So, if you’re picking up a copy of Walk It Out for someone you care about also consider picking up a copy for yourself too. I know you’re be inspired in new ways! But don’t wait. Walk it Out is currently being offered as a pre-order special, discounted from the list price. We all want to save money right? Not only that, if you order Walk It Out before the October 1 release date I have a special gift for you—and for the friend you’re sharing this book with. 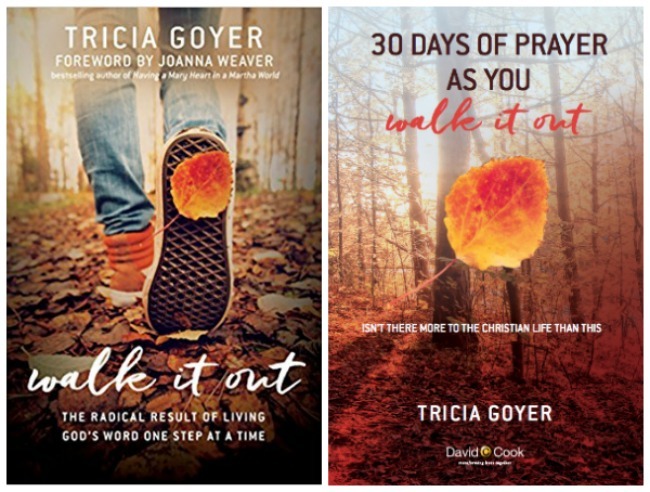 It’s a free ebook, 30 Days of Prayer as You Walk It Out. Follow the link provided on this page to discover how this free resource can be yours.This free prayer guide will only be available to those who are pre-ordering the book. And the best part is, you won’t have to wait. This prayer guide, centered on the truths in God’s Word, can show up in your inbox today. All you have to do is follow the link and take a few simple steps.Remember, check the link on this page to discover how this free prayer guide can be yours … and you have my permission to pass it on to your friend who needs it. Help me to spread the message that knowing and following God’s will doesn’t have to be a mystery. Each of us can discover it one step at a time … starting today! Are you new here? You might want to subscribe to my email updates, or follow me on Facebook, Twitter, Pinterest, Google+, or Instagram.